Halcyon’s Leaders. Photograph, early 1920s. In the foreground are John Varian and Dr. William H. Dower; behind them are Jane Kent Dower, Mrs. Wilkins, Ernest Harrison, and Agnes Varian. Dr. Dower and Mrs. Francia LeDue officially founded the community in 1903. 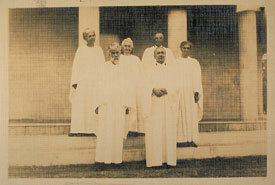 The Varian’s, Theosophists from Syracuse, New York, joined them that year.